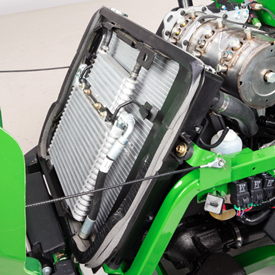 The 1500 Series TerrainCut Front Mowers are powered by liquid-cooled, 3-cylinder diesel engines. 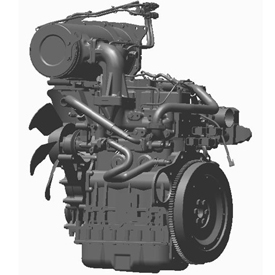 These engines feature low levels of exhaust and emissions, reduced noise levels, and excellent fuel economy. They also meet the necessary Environmental Protection Agency (EPA) Tier 4 emissions requirements. Models 1570, 1575, 1580, and 1585 are biodiesel compatible from the factory up to B20. 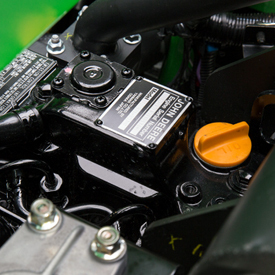 Model 1550 requires an optional kit to be compatible with B20 biodiesel fuel. A Kanzaki® 30-cc transmission is used for reliable operation. High-capacity hydrostatic transmission and heavy-duty transaxle maximize performance and uptime and minimize cost of maintenance. Charge pump is used to efficiently deliver oil to the transmission. 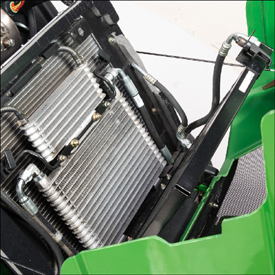 Oil cooler helps maintain optimum transmission oil temperature for superior performance and longer transmission life in the most challenging operating conditions. Maximum forward top speed is 12 mph (19.3 km/h) on the 1550, 1570, and 1575 and 15 mph (24.1 km/h) on the 1580 and 1585. Self-bleeding design helps keep air out of the system. Kanzaki is a trademark of Kanzaki Kokyukoki Manufacturing Company. On-demand four-wheel drive automatically engages and disengages as needed. Full-time four-wheel drive is on at all times. Two-wheel drive position is available on 1580 and 1585 with two-speed transaxle. The design results in a lower center of gravity for better stability and traction on hillsides and slopes. Rollover protective structures (ROPS) are integral members of the frame. 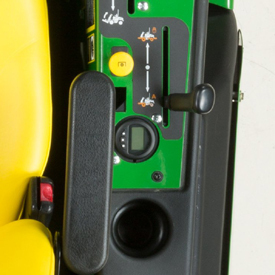 Lift-control lever is conveniently located, within easy reach of the operator's right hand. Two-speed transaxle shift lever is standard on 1580 and 1585. 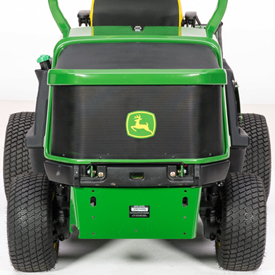 TerrainCut™ Front Mowers have an operator-presence system. Master brake must be depressed or the parking brake locked; the hydrostatic foot controls will then be in the neutral position. Ignition key must be used. 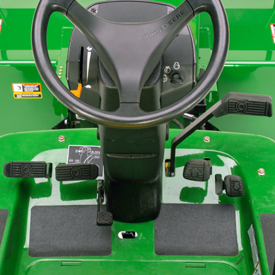 In addition, once the engine is running, an interlock automatically shuts the engine and PTO off if the operator leaves the seat. 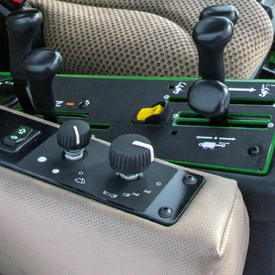 To keep the engine running, the operator must disengage the PTO and set the parking brake before dismounting. 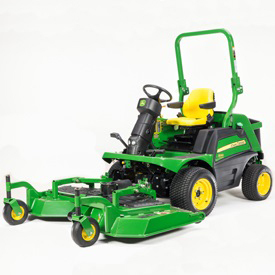 Since 1998 the John Deere 7-Iron™ mower deck has demonstrated commercial quality, performance, and durability. 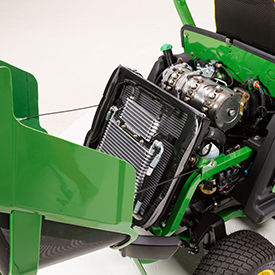 The 7-Iron PRO, Fastback™, and V-Flex mower decks deliver an even higher-quality cut in even more diverse conditions. 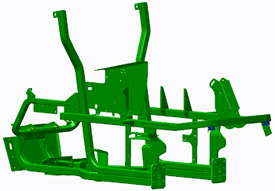 Rear weights (R66949) are required based on machine configuration. Must also order TCB10303, rear weight mounting bracket. 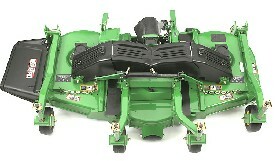 *Mower deck offset for trimming capability. Vehicle track width is 2 in. (5.1 cm) wider on the discharge side of deck. This may cause the tire to drive over uncut grass on discharge side of deck. 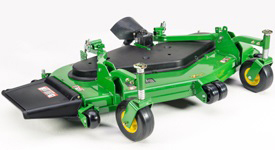 NOTE: These mower decks will not retrofit to F900 Series or F1145 Front Mowers. The rotation angle will vary depending on deck size and power unit tire size. No tools are required to access belts. 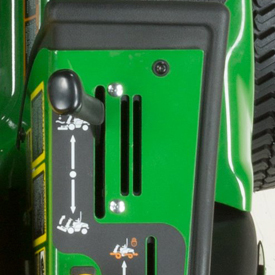 The underside of the mower deck is easy to access. 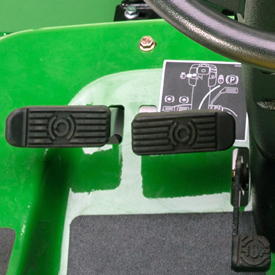 Easy on/off design simplifies installing and removing mower decks. Top, greaseable spindles can be accessed without removing belt covers. The Rotate for Service position also reduces the length of the machine for trailering. 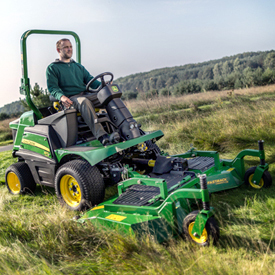 TerrainCut Front Mowers comply with ANSI B71.4 safety certification. 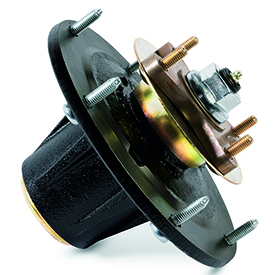 The mower spindle housings are made of ductile cast iron, except for the 72-in. 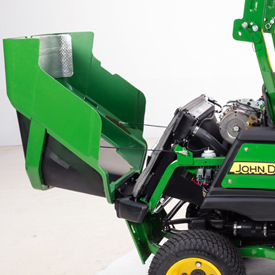 (183-cm) 7-Iron V-Flex Side-Discharge Mower Deck, which has an aluminum center spindle housing and cast-iron gearboxes to drive the outer blades. Ductile cast-iron material provides superior impact strength. Gusseted design puts reinforcement where it is needed. Strength of cast iron protects against damage from blade impacts. Grease fitting is mounted at the top for easy access. Grease pressure-relief valve minimizes seal damage from overfilling with grease and keeps debris from entering housing. The 8-in. (20.3-cm) diameter housing distributes loads and impacts to minimize deck-shell damage. Spindle allows ability to be rebuilt. NOTE: The 72-in. 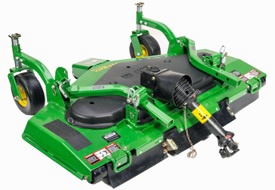 (183-cm) 7-Iron V-Flex Side-Discharge Mower Deck has an aluminum center spindle housing. The outside blades are driven by cast-iron gearboxes. 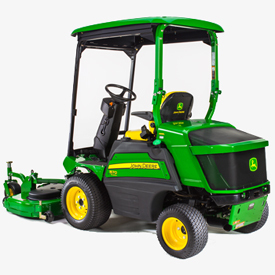 Government bids that specify a rear discharge mower. 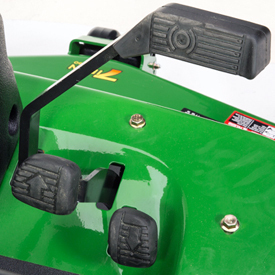 Mower deck is constructed of 7-gauge, 0.179-in. 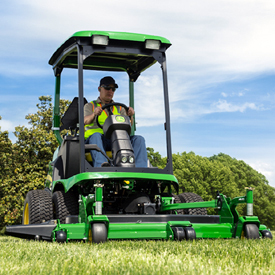 (4.6-mm) steel for the strength to stand up to the demanding use of commercial and municipal mowing applications. 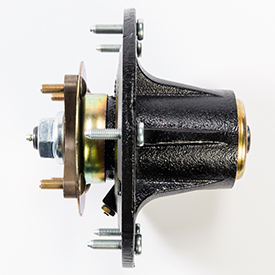 Blade spindle housings are made of ductile cast iron. 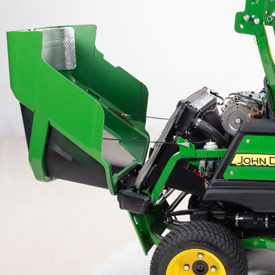 produces a finished appearance that competitive rear-discharge mowers cannot match. The belt-drive system has an easy-to-adjust tension device. By using a spring system, the risk for over tensioning is eliminated, ensuring a long belt life and excellent performance during the season. For easy service and maintenance, the deck can be rotated into the vertical locked service position. Deep-deck design increases airflow so more material can be processed. Operator can trim with either side. Dual side trimming increases operator productivity. 1-in. to 6-in. (2.5-cm to 15.2-cm) cutting heights, in 0.5-in. 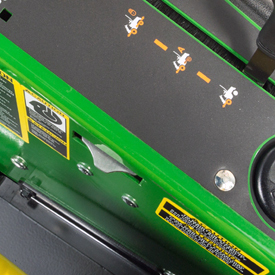 (1.3-cm) increments, allow the operator to match all mowing conditions. Gauge wheels, rollers, or side-mounted skid shoes lift the deck over uneven surfaces for a well-groomed appearance. Double-captured anti-scalp wheels provide increased durability. 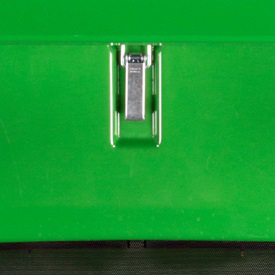 Easy lift and lock system for service purposes. Standard semi-pneumatic caster tires will not go flat when punctured. Spindles can be greased without removing belt shields. 1-in. (2.5-cm) cold-forged spindles are strong for long life. 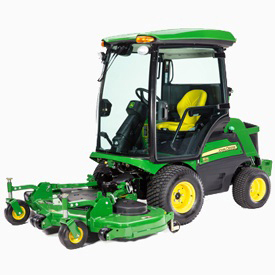 Blade tip speed of 18,000 fpm (5486 m/min) for more blade strikes per inch mowed. Redesigned front baffle manages airflow and controls clippings better. Spindle pocket reinforcement gives even greater structural durability. 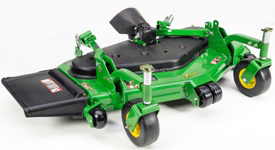 Adjustable anti-scalp wheels help smooth out the mowing job. Standard semi-pneumatic caster tires will not go flat from punctures. The mower deck is stamped from 7-gague, 0.179-in. (4.6-mm) steel to minimize the number of welds and provide a smooth underside, with fewer sharp corners, for reduced material buildup. 0.75-in. 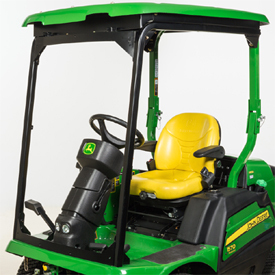 (1.9-cm) solid steel bar is welded to mower deck perimeter for added strength. The rounded corners of the stamped deck help distribute impact stress to reduce the potential of damage when the mower contacts trees, rocks, curbs, and other fixed obstacles. A deep-deck design of 5.5-in. (14-cm) delivers excellent airflow so material can be processed quickly and efficiently. 1-in. to 6-in. (2.5-cm to 12.7-cm) cutting heights, in 0.5-in. 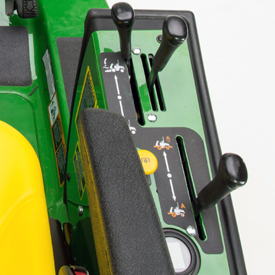 (1.3-cm) increments, allow the operator to match all mowing conditions. Baffling system eliminates clumping, blowout, and windrowing. Wide discharge opening provides even clipping dispersal for an excellent, finished appearance in all conditions. Added strength to stand up to the demanding uses on the golf course. The deck has a patented vertical belt drive system, which allows for the deck to articulate 20 degrees above and below center. This design also allows for belts to stay clean and prevents the belt from stretching and twisting when flexing. The mower deck is stamped from 7-gauge, 0.179-in. (4.6-mm) steel to minimize the number of welds and provide a smooth underside, with fewer sharp corners, for reduced material buildup. Operator comfort enhances productivity. 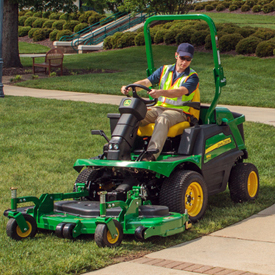 The open station TerrainCut™ Front Mowers can be equipped with three seat options that have features and adjustments to make most any operator comfortable. 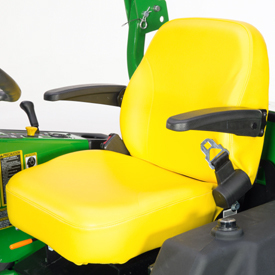 Two factory-installed seat options are available for extra comfort for long-day productivity. A single hood latch is located on top of the hood behind the seat. Designed-in service accessibility helps ensure daily maintenance is completed to keep the machine operating at peak performance. The hood can be totally removed, if necessary. The seat flips forward for access to air filter, fuse bank, engine oil dipstick, and front of engine. 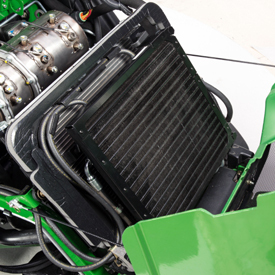 Easy-to-turn knobs are provided to release the air conditioning condenser (1575 and 1585 only) and fuel and hydraulic oil coolers so they can be tilted back to permit thorough cleaning between them and the engine coolant radiator. 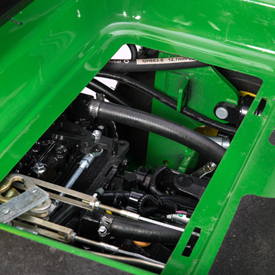 The panel on the foot platform can be removed for access to the transaxle, PTO shaft, and most linkages. ORS fittings seal at a lower torque to prevent leaks. Fittings can be removed from a damaged hose and installed on another hose. Downtime and cost for repairs are reduced considerably. 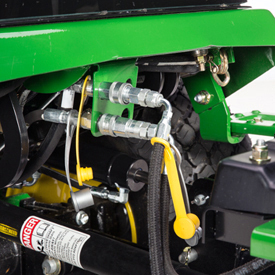 The service-latch pin allows mower deck to lock into position to ensure deck is held in position for cleaning or service. The top-greaseable spindle grease fittings can be accessed without removing the belt covers. 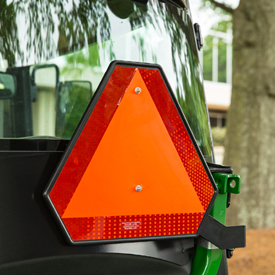 Front mowers must be properly ballasted for both good performance and safe operation. 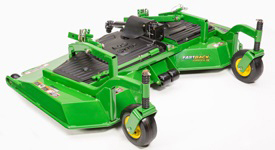 Ballast requirements differ depending on the front mower model and the implement being used. The chart below gives the minimum ballast requirements for the various product configurations. Additional ballast is recommended for operating on slopes or other conditions that may warrant it. NOTE: Use only implements and accessories recommended by the manufacturer. 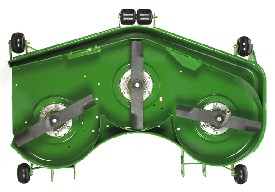 1575/1585 Cab models: Rim design allows for tire assembly to be mounted in two different configurations, a narrow track or wide track width to meet ballast requirements. 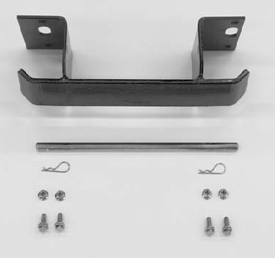 *42-lb (19-kg) (R66949) Quik-Tatch weight (installation requires TCB10303, rear weight mounting kit). **50-lb (23-kg) front wheel weight(s) required (installation requires BM17985, mounting hardware kit). ***NA - Not recommended for use on front mower. NOTE: Ballast requirements may change. Always refer to the implement owner's manual for the appropriate ballast requirements. 1575/1585 Cab models: Rim design allows for tire assembly to be mounted in two different configurations, a narrow track or wide track width, to meet ballast requirements. * 42-lb (19-kg) (R66949) Quik-Tatch weight (requires TCB10303, rear weight mounting kit). ** 50-lb (23-kg) front wheel weight(s) required (installation requires BM17985, mounting hardware kit). NA - Not recommended for use on front mower. 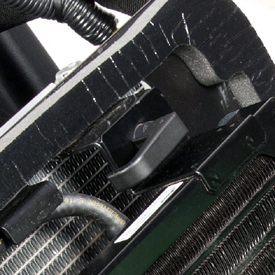 Heater adapter attaches to the engine cylinder block. 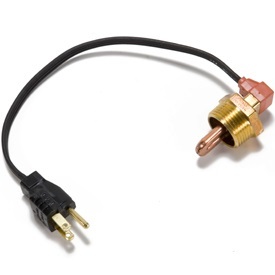 Heater plugs into a 120-V electrical outlet to warm the engine for fast cold weather starts. It has a 400 W rated output. The hydraulic weight transfer attachment allows transferring weight of an implement to drive wheels for improved traction in slippery or hilly areas. 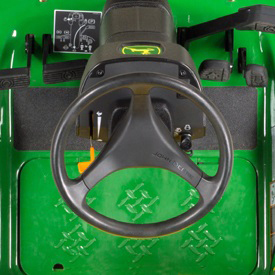 The hydraulic weight transfer adjustment wheel is located on the control panel to the right of the operator for easy use. It is adjustable from full-off to full-on while on the go. This light is required by some governmental agencies and on some worksites. It provides increased visibility of the unit when in operation and mounts to the top of the rollover protective structure (ROPS). NOTE: The b eacon light mounts to the top right ROPS tube on two-post ROPS and four-post ROPS assemblies. 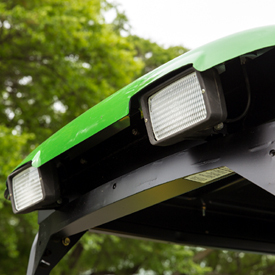 Front worklights mount to the top frame of the four-post ROPS. The cruise control kit maintains desired speed without foot pressure. 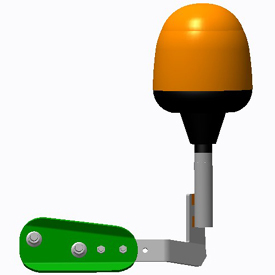 The reverse alarm attachment is available for improved safety and for those who require an alarm in reverse speeds to satisfy safety regulations and governmental bid requirements. This emblem attaches to the ROPS for transporting on public roads. Available on cab and open-station models. Gives the operator a view to the rear at a quick glance. The four-post ROPS consists of two front posts, welded top and bottom assemblies, and a molded roof. 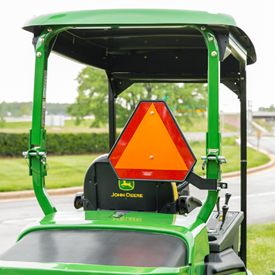 This front windshield mounts to the four-post ROPS. Attach to drive tires for additional traction in snow and ice. One or two weights can be installed on each drive wheel if extra traction is desired. 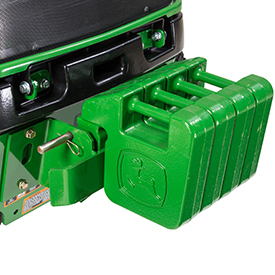 Wheel weights will fit on both the 1400 and 1500 Series II Front Mowers. 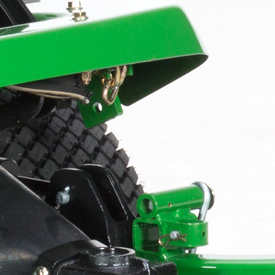 Allows operator to mount ballast weights for additional traction (four R66949 or UC13263 42-lb (19-kg) Quik-Tach weights are recommended for snow blower applications). 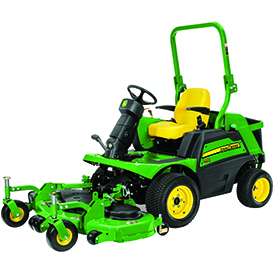 Less mower deck, 86.7 in.